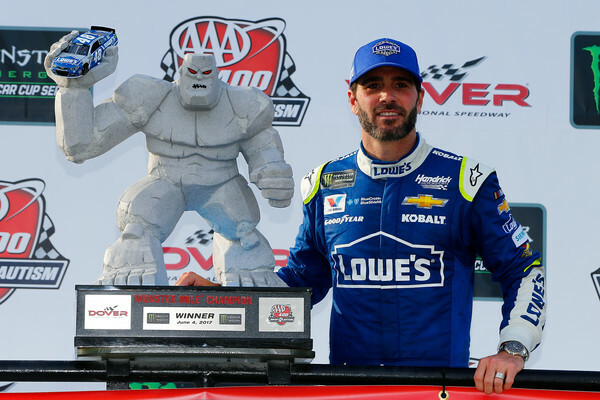 They don’t call Dover International Raceway the Monster Mile for nothing… and Sunday provided the NASCAR Monster Energy Series with quite the challenges. The concrete mile presents its own unique set of racing issues…and it always has. Have you seen the trophy? It’s of the concrete monster mascot, Miles. “After taking the green on the overtime restart, if the leader then passes the overtime line on the first lap under green before a caution comes out (a “clean restart”), it will be considered a valid green-white-checkered attempt. However, if a caution comes out before the leader passes the overtime line on the first lap under green, it will not be considered a valid attempt, and a subsequent attempt will be made. If necessary, multiple subsequent attempts will be made until a valid attempt occurs. Jimmie Johnson cleared the overtime line well before the caution was thrown. If you watch the race replays- the actual contact that necessitated the caution actually doesn’t take place until nearly the overtime line and Jimmie was well in front of that mess. It’s not a new rule- all the drivers know of this rule. Most fans know of this rule. I don’t know what about the rule could be less clear- except maybe where the “overtime” line is…maybe NASCAR needs to paint it on the wall for everyone to see. Jimmie winning is not some big NASCAR conspiracy so that Jimmie can get an 8th championship. It never fails to surprise me that the conspiracy theorists come out in droves when Jimmie wins anything. I don’t understand the hate…I really don’t. The most recent comment I saw was that Rick Hendrick bought the win. If Rick Hendrick was going to buy a win- don’t you think he’d do it for Kasey Kahne- who’s poor performance is losing him sponsors- including Farmers and Great Clips or even Dale Earnhardt Jr since it’s his last year and he’s NASCAR’s most popular driver for what seems like the 33rd year in a row (I know it’s not- that is me exaggerating). Why buy a win for a team that is already solidly in the chase? Maybe I am just dumb but I don’t see these conspiracy theories as being valid. If you don’t like Jimmie Johnson- don’t like him. I have drivers I don’t like. For a time in the late 90s- Jimmie was one of those drivers- however his social media interactions have completely turned that around for me. But even if I didn’t like the guy- I didn’t claim that NASCAR favored him or his owner. I just said “Urg I can’t believe that guy won…again.” I didn’t blame his win on NASCAR. I also think that NASCAR needs to stand by the rule- kowtowing to the opinions of a few fans and a couple of drivers in the middle of a season would only make them look like a joke and that is not press the sanctioning body needs or wants. Maybe revisit the rule at the end of the season if you must. But for people who say that NASCAR changes the rules every race- to want the rule changed is silly and nearly hypocritical. I am not saying that Kyle Larson doesn’t have a reason to be upset- Miles bit him. But Jimmie had a strong car as well- he came through the field from last and finished first. I thought Larson’s post race interview was on point. While he was disappointed he handled it with quite a bit of grace. That said- the race at Dover was pretty good- I mean you have some crazy things like Kyle Busch’s wheel flying off after a pit stop because his changer goofed and didn’t tighten any of the lugnuts. According to the national broadcast that is a mandatory 4 race suspension for the crew chief, tire changer and tire carrier…but then I read that NASCAR can choose to go easy on the team if they deem it wasn’t intentional. I don’t think it was intentional but I still feel that they should have to be penalized. Do teams intentionally remove equipment from the pit box? No but it happens and they get penalized in-race for it all the time. I guess you could say it’s apples and oranges since I am comparing in-race penalties to post race penalties but hey sometimes things happen.